I linked yesterday to Ann-Marie Slaughter‘s excellent presentation to PopTech on International Relations and the non-state actors that influence and even dictate so much development in the world. Watching it again this morning (and it’s worth watching twice) a number of questions crossed my mind. First, she talks about social actors and ad hoc networks, but never quite gets to social networks. Just as ad-hoc supra-national organisations are bringing together strange bedfellows, and getting ahead of the State actors in driving change, people are developing connections and social networks beyond traditional family and even cultural groups; one could argue that technological change is facilitating the re-structuring of the DNA of culture. Kin, geography, language, religion and race remain important, but they are no longer the exclusive determinants of social alignment. People connect now through trade, sports, entertainment, hobbies, and other interests, forming close relationships. 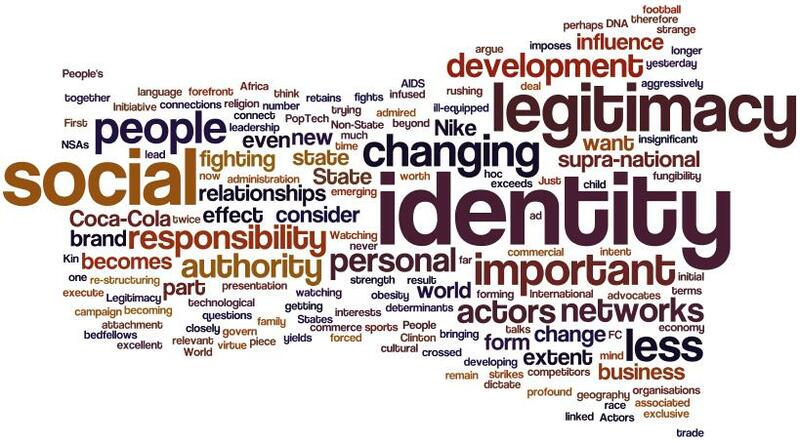 People’s identity – closely tied to these relationships – is changing. National identity is less relevant. This fungibility of identity is having a profound effect on the administration of government, on democracy, and on legitimacy. When national identity is an important part of personal identity, the state retains greater strength. When it becomes less important, the state becomes less important. At the same time, supra-national institutions – from the Clinton Global Initiative to Barcelona FC to Nike and Coca-Cola – are infused with a legitimacy and responsibility that far exceeds their initial intent. They have, in effect, an authority to influence, to govern and to lead, by virtue of the extent to which they are admired (perhaps Joe Nye’s soft power is not exclusively a state thing), or perhaps the extent to which they form part of personal identity. It therefore strikes me that as we consider State Legitimacy in a Globalised World, we should also consider the legitimacy of Non-State Actors. Some of these NSAs don’t want that authority, they don’t want that ‘legitimacy’, because it imposes upon them a social responsibility that they are ill-equipped to deal with. Football teams and football players find themselves at the forefront of the campaign against racism. Nike finds itself fighting against AIDS in Africa. Coca-Cola fights against child obesity in America. These companies are being forced into the development of new capabilities as a result of unfettered brand development, brands which are aggressively rushing to own a piece of personal identity in people all over the world, and while that identity attachment yields commercial results in the form of more people buying their stuff, and more people becoming brand advocates, the associated cost in terms of social responsibility is not insignificant. So while States are fighting to have more legitimacy, and more authority to execute social leadership, MNCs are actually trying to have less, in a sense. It’s not their core business. But business is changing, commerce is changing, and – it would appear – identity is changing too. If we think about the economy of legitimacy, new competitors are emerging.